With Autumn settling itself in, the colder weather is meaning children are playing inside more and more. How can you keep children entertained during the next few months without spending the national debt of a small country? Arm yourself with a cup of tea, find a comfy spot to perch for a good hour or so and open up the Baker Ross website. We are super lucky to be part of the Baker Ross Ambassador group and every so often receive a wonderful box of crafting goodies for children… adults can join in too! This year’s Autumn and Halloween box has literally just arrived and already an abundance of green fluffy spiders and vibrantly coloured Halloween treat gift bags are popping up in our house. 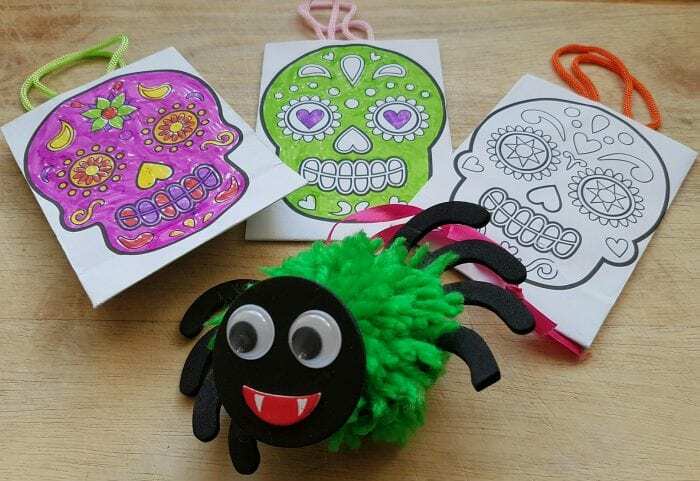 Part of the Baker Ross Halloween craft range, these particular kits are very easy for Mini Me and her friends to craft on their own. To the point I didn’t even have time to snap a picture of the whole box together! The multi pack of colouring pens in the box really did help with an immediate colouring in session. I have no idea if we have a ‘pen monkey’ in our house, but whenever you need a colouring pen there is never one to be found, thankfully we now have lots of new pens – The felt tip pens are a available in a pack of 3 for £1.98! The next craft pack we are going to tackle, hopefully tonight is the Leaf Sand Art Decoration pack (priced at £3.49 for a pack of 5). Mini Me has already been informed we are doing this together, simply for the fact I don’t want sand everywhere! The beauty of this pack is the fact no glue is required – seriously! The leaves are stickers that simply require peeling and then sand can be applied. This is what I love most about the Baker Ross craft kits, the fact they are so straight forward and easy to use, with limited requirements for other craft items you may or may not have in your house. Hopefully our Halloween Pom Pom spiders will cause a stir… or a scream this Halloween! There are some really great ideas here and the Ross Baker kit looks so good because everything is delivered in one go. I love the green fluffy spider, too – more creative than a plain black one!